All late-generation iPads and iPhones now allow you to take your productivity to the next level with the built-in apps. 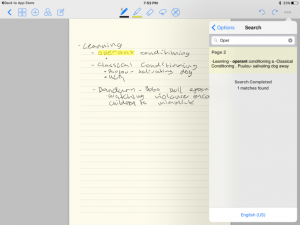 Notes is a very simple note-taking app. Every iPhone and iPad comes with the Notes app. With this app, you can enter text, cut, copy and paste text between Notes and other apps such as Safari and Mail. You can’t do much with Notes other than that, but it is convenient and a simple way to enter, store and edit your notes. If you want an app for notes with more functionality, look into Evernote or Microsoft OneNote. Evernote is a cross-platform app developed by Evernote, a corporation located in California. In Evernote, a note can be much more than just text. It can be a part of a web page, a voice recording, a handwritten text, a picture and more. Notes in Evernote can also have attachments. In Evernote, you can organise your notes in a variety of ways. You can create notebooks of notes. You can tag notes and annotate them. Evernote comes with a great search function. The product has both free and paid versions. One of the most limiting features of the free version is that you can only sync notes on up to two devices. This limitation does not exist in another app that directly competes with Evernote. This app is Microsoft’s OneNote. Just like Evernote, OneNote supports notes that include drawings, web and page clippings and audios. OneNote is available as part of Microsoft Office suite, but it is also available as a separate standalone free app. To get it, you can simply download it from the app store or get it for free from Microsoft’s website. You do not need to install Microsoft Office or any other Microsoft product to do so. With OneNote, you can synchronise your notes on a variety of devices for free. Copyright © 2019 web-store-uk.co.uk. All Rights Reserved.